Arsenal have signed Villarreal defender Gabriel Paulista for 15m euros (£11.2m) with forward Joel Campbell joining the Spanish side on loan until the summer. 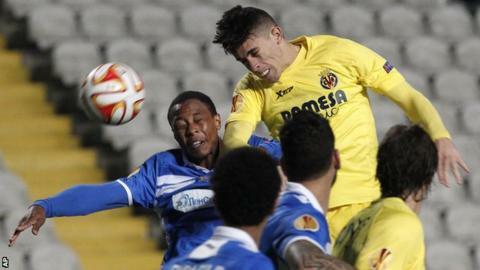 Brazilian Gabriel, 24, was ever-present for Villarreal this term and could face Aston Villa on Sunday. He said: "I had a talk with my family and I told them that it was my dream to play in the Premier League. "The fans can expect a Gabriel that on the field has a lot of will to be able to help the team win important things." Speaking on his video blog, Arsenal striker Campbell said he is "very excited with this new opportunity"
Arsenal were granted a work permit for Gabriel, who can play at centre-back or full-back, on Monday, despite the fact he is uncapped and not a European Union citizen. He joined Villarreal from Brazilian club Vitoria in 2013. Gabriel is available for selection for Arsenal's Premier League home game against Villa. Campbell, 22, has signed a new long-term contract with the Gunners before heading to Villarreal for the rest of the season. He signed for Arsenal in 2011 from Costa Rican club Deportivo Saprissa SAD but has yet to score for the Gunners. He has been loaned out to French club FC Lorient, Spanish side Real Betis and Greek outfit Olympiakos in the past.